In the late summer of 1923, the city of Staunton was in big trouble. They were running out of water. For Staunton, this was nothing new. Unlike Waynesboro to the east with its powerful springs and the South River, Staunton had never had a good supply of water. That is why most of the large industries eventually located in Waynesboro and most of the schools and institutions located in Staunton. A read through the 19th century Staunton town minutes is like a non-stop search for the Holy Grail as the city fathers looked at this spring and that spring and this stream and that stream in an effort to find water to use for household and business operations and for which to fight fires. A century and a half of continuous effort had only allowed the city to get by with its water situation, but never to get ahead. Until 1923. The story you are about to read concerns a city, perched on the brink of disaster, that turned its destiny around through visionary leadership by a city council and brilliant design by engineers. All of the players in the story are long gone. But what that council did – J.W.H. Pilson, H. M. Smith, H.L. Lang, S.P. Silling, Edward Woodward, F.N. Moran, J. Harry Bryan, and G.F. Garber, as well as city manager W.F. Day, and E.L. Shuff, water department superintendent — changed the course of history for Staunton. And, as you will see it took courage, ingenuity, and old fashioned hard work. Evidence for the city’s constant search for good water can be seen in the pump house “way out” at Gypsy Hill Park. The springs at the park were first developed to help provide water for the citizens in 1876. By 1923, 11 springs at the park had been directed to the pump house. In addition, the city drew water from Buttermilk Springs. By 1923, the aging steam driven pumps and other infrastructure supporting the water system were in fair to poor condition. The water from the springs was hard and, according to some, possessed an odor that took time to get used to. Further the distribution system to the city’s 11,000 inhabitants was aging as well. At times only 36 gallons a day reached each consumer. Each September, when the city’s many boarding schools brought in 1,500 additional inhabitants, water shortages only worsened. Times had changed by the 1920s. People had new-fangled things like lawns that they liked to “sprinkle” and horseless carriages that they liked to wash. More and more homes had indoor bathrooms that required water for flush toilets, bathtubs, and sinks. Even the city itself had taken to adding to the crisis by washing down the streets. In late August of 1923 the water superintendent watched anxiously as the water supply in the city reservoir dropped lower and lower. Finally a special city council meeting was called and an emergency ordinance was quickly passed to decrease water usage. Residents were prohibited from watering lawns, filling swimming pools, or washing cars. Calling the situation a “water famine” the council opined that it hoped that this limitation would allow the reservoir to refill so that they would not have to resort to stricter measures. It was felt that if the city suffered a large fire during this period, that the entire water system for the city might be compromised. The emergency measures were nothing new. In previous years the city had been forced to cut off the entire water supply each night to save water. However, thankfully by August of 1923, the city fathers had already begun taking action to change their destiny. ​In April of that year the city council had signed an agreement with the engineering firm of Fuller & McClintock out of New York requesting that they conduct a thorough study of Staunton’s water situation, analyze all future sources of water, and make a recommendation of what the city should do to ensure that it had an adequate water source until at least 1955. The firm worked all spring and much of the summer on the project, looking at springs, wells, and rivers from one end of the county to the other. 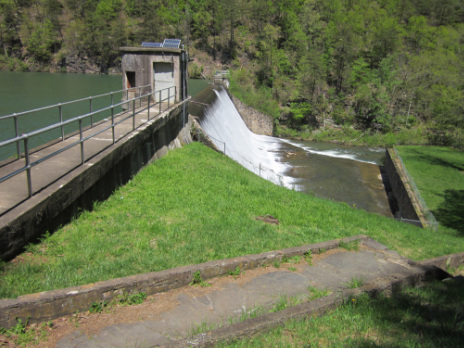 Each source, such as the one at St. Mary’s in the southeastern part of the county near Rockbridge County, was evaluated for volume capability, quality of water, legal issues (such as land purchases and easements), potential of future development (and as a consequence contamination) around the water source, and infrastructure needs such as dams, wells, and piping. It was a wise choice. The Shenandoah National Forest, soon to be renamed the George Washington National Forest, was only a few years old. For a decade or so the U.S. Department of Agriculture had been buying up tracts of timbered-over land in the western part of Virginia in order to control erosion and protect water supplies. Of all the sources considered, the North River was also the one best capable of supplying the projected 1955 requirements of 2.5 million gallons a day. But to the city fathers, the recommendation must have appeared somewhat daunting. Can you imagine how you would have felt upon hearing the recommendation that you had to go miles away from civilization in the rugged mountains and build a 300-foot long, 50-foot high concrete dam using a combination of steam-powered equipment, hand tools, and even mules? The dam had to have all the control valves and piping to take water from the reservoir, through a pipe to Staunton. To get that water through a pipe to Staunton, the construction workers had to dig a tunnel nearly 6,000 feet long through Lookout Mountain. The tunnel, which would start at the dam and exit near Stribling Springs, was to be six feet high by four feet wide, and carry a 20-inch cast iron pipe through the mountain where it would then connect to 14 miles of 16-inch cast iron pipe that ran into a city reservoir. One can only imagine the stunned thoughts of the council in a city where horse-drawn wagons still mixed with automobiles on downtown streets. The Staunton newspaper followed the water project from start to finish and more than anything else the tunnel captured the public’s imagination. The 5,680-foot tunnel through the mountain was started on each end on November 1, 1924. On January 28, 1926, the newspaper reported that the workers coming from each end could hear their counterparts. “Two crews of drillers, pushing forward from opposite sides of the mountain, now are within ‘hearing’ distance of each other. As the steel drills eat their way into the rock on one side, those on the other can hear the grinding noise,” noted the paper. Then in late February, a dual blast opened up the tunnel from end to end. In just over 16 months the Baltimore firm of P.G. Ligon had simultaneously worked two 10-man crews (one on each end of the tunnel) 24 hours a day, six days a week. All but 100 feet of the tunnel was through solid rock that had to be carved and blasted. When the crews met they were off only a fraction of an inch. The tunnel portion of the project cost about $176,000. The report was presented to the council in August of 1923 and, after doing a month’s worth of quiet negotiation with the federal government, council voted unanimously in October to move forward with the plan. The project was let out in four contracts – the storage dam construction, the tunnel construction, the pipe lines, and the distribution reservoir in Staunton – and by early 1924 work was under way. The undertaking for such an engineering project was massive. The Augusta County Historical Society and the forest service office just outside of Harrisonburg have a dozen or so photographs showing the construction site. To say that conditions look primitive is an understatement, but, amazingly, in less than three years, Stauntonians were turning on their taps and enjoying the steady stream of soft water straight from the national forest. The autumn of 1926 brought a new era to the city. Previous falls with the influx of students at SMA, VSDB, Mary Baldwin, and Stuart Hall, had been eyed quite warily knowing that the city’s water needs would soar as well. Starting that year, however, the city fathers could anticipate football games and the state fair coming to town rather than worry about water rationing. Although the water worries were a thing of the past, Staunton’s government had learned to never take water for granted. Ninety years have passed since that fateful summer of 1923. Staunton has not been asleep at the wheel since then. Maintenance, expansion, and modernization have been the driving force behind the city’s water system. The city has grown in population and geographic area since the 1920s and today’s water usage of 4 to 4.5 million gallons a day would have been beyond the comprehension of the early 20th century city council. But because of those actions taken in 1923, the city is in no danger. City staff and elected leaders have built upon the opportunity given them in the 1920s. Today the dedication plaque for the North River project has a place of honor in the Staunton water works building. It serves as a constant reminder of the foundation upon which their future is built. The city has not been idle since 1926. Today just under 50 percent of the city’s water continues to come from the 21-acre North River Reservoir that drains 17,000 acres in the national forest. “It is well protected and well preserved,” Tom Sliwoski, Staunton’s Director of Public Works said of the average daily yield of 2.2 million gallons a day. Most of the rest of the city’s water, about 2.5 million gallons a day, comes from Gardner Springs near Franks Mill. All told Staunton’s public water goes to somewhere between 27,000 and 28,000 people daily including over 800 commercial hookups. By a long standing agreement, Augusta County is required to buy a million gallons of water a day from the city. All told there are five water tanks, 12 water pump stations, 923 hydrants, and 153 miles of pipeline within the city. A modern water plant was built in 1950 and has been upgraded and modernized many times over the years. “It’s a challenging system to maintain especially with our hills and topography, but we have good water sources, good treatment, and good people,” Sliwoski said. Irvin and others in the department work hard to make sure that the crown jewel in their water system is not deteriorating despite its age. Tools called “pigs” are put into the pipes to clean them out and inspect them, and recently divers were hired to look at the underwater side of the cement dam with cameras and make any necessary repairs. And, although the approximate life of cast iron pipe is 100 years, both Sliwoski and Irvin say that the pipes are holding their own. Nonetheless, there are plans in place for the future in regard to tunnel, pipe, and dam repairs. A self-described “engineer geek” Irvin marvels at the stone stairs that were built to the top of the dam and the drainage points that good engineers put in the dam structure itself. Quality design and quality construction should take the North River water system well into the future with the proper oversight from city staff. When Staunton decided to build its water system deep in the national forest, negotiations had to take place with the forest service. The deal is this: the city owns the dam, its associated structures, and the piping, but only leases the land from the forest service. The forest service maintains a small picnic area at the dam site that, on the day of a recent visit, was being used by three people and three horses who were on a day outing in the forest. One million visitors recreate in the national forest each year and the North River dam area is one such place. 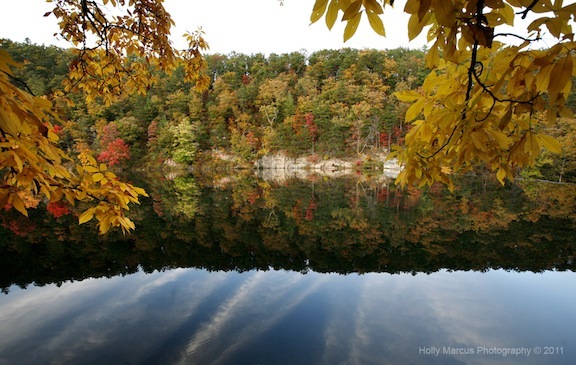 Visitors can use those stone stairs to hike to the top of the dam and take a trail along the reservoir. Boats and swimming are prohibited in the reservoir, but the nearby flood control dam at Elkhorn Lake offers even more recreational diversity. 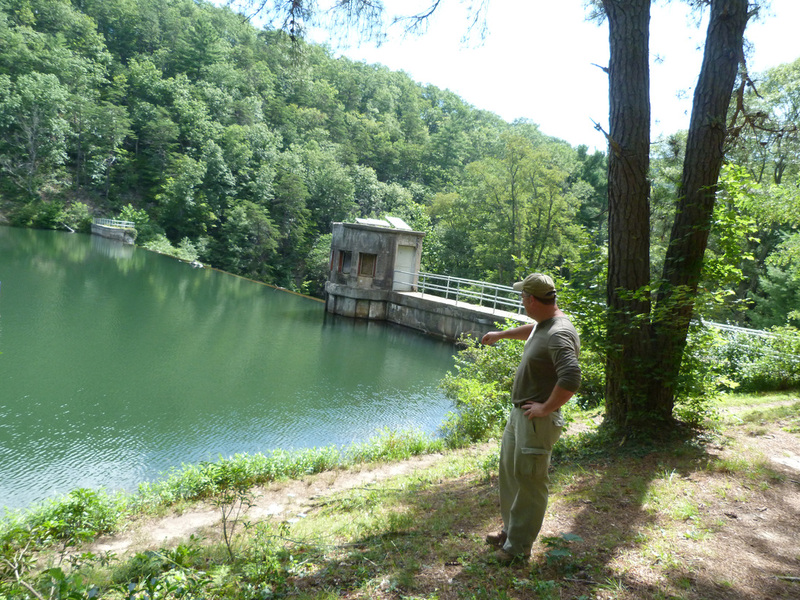 The earthen dam there holds a 52-acre reservoir, much larger than the 21-acre lake at the Staunton dam. Because the North River flows north, Elkhorn drains into the Staunton Reservoir. It is ironic that one of the biggest threats to Staunton’s water supply today could be hydraulic fracturing in the national forest. This high pressure horizontal drilling technique used to extract natural gas from shale deposits deep underground has the potential of contaminating ground and surface water in a variety of ways. The irony here is the fact that Staunton chose the national forest specifically because of the promise of permanent protection from pollution and development. Whether or not the long-overdue management plan for the George Washington National Forest allows fracking remains to be seen. But many worry about the potential impact on Staunton’s water in myriad ways. Some of those ways are obvious, but other are less so. One very real worry is the tunnel. In 1926, a worker could walk end to end to inspect and work on the pipe. Over the last 90 years, the mountain has slowly settled over the pipe so that today one cannot visually inspect the pipe or even walk inside the tunnel from end to end. For all practical purposes it is an underground pipe. The crews that maintain the water supply through the mountain rely on cameras and internal tools to keep the nearly 100-year-old system fully functioning. Any shift in the mountain, such as a seismic disturbance, could cause irreparable harm. The cost of digging a new tunnel might well be beyond any municipality’s budget. It is a worry that has been on the minds of Staunton City Council members. The city as well as many other localities including Augusta County, Harrisonburg, Rockingham, and Rockbridge have requested bans on fracking in the national forest, specifically because of the threat to the area’s water supply. One of those very concerned is Staunton councilman Jim Harrington. "Of the many things I have learned since becoming a member of the Staunton City Council, one of the most impressive and inspiring is the story of Staunton's water supply. Almost a century ago, city leaders summoned the foresight and the political courage to secure an abundant source of clean water for the city's future. They acquired the source almost 30 miles to the west of the city and they overcame many obstacles (including tunneling through the mountain) in order to provide for the city's needs,” he said. “Staunton, along with our neighbors up and down the Valley and as far north as Washington, have prospered in part because of this generous resource. To endanger this resource by employing the dangerous and damaging techniques associated with hydrofracking would be irresponsible and foolhardy. There is too much at stake...the natural beauty of the forest land, the purity and abundance of the water supply, the health and well-being of our citizens...to gamble on this risky method of gas extraction,” he added. From its founding in the 18th century until the 1920s, Staunton’s future prosperity was always clouded by the uncertainty of water. Ninety years ago this summer, the city’s leaders took a bold and visionary step that changed the course of the city’s history. They were able to do this because of their trust, reliance, and partnership with the federal government and its newly formed national forest. And they were able to create that future because of a taxpayer investment in quality designers and contractors. Those original visionaries are long gone, but the leaders who followed have continued to build upon the promise launched so boldly that summer long ago. It is a history worth remembering and a public trust worth maintaining. ​Photos from William Farnsworth Day Collection. WF Day was Staunton's City Manager during the time the Staunton Dam was constructed.